You’ll also aim to get at least 1 mile of walking in daily. Again – it can be broken up into 2 half mile walks. In week 3 we’ll aim to start going through the above training sequence 2x through, every other day. 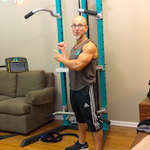 On the alternating/opposite days – I want you to go through the neck training sequence video (the second video) to recondition your neck muscles. And by week 5 or 6 we should be ready to add to your program and build on the foundation you’ve started developing. After we meet for a FIT-Q assessment (about 5 weeks), I'll know what you'll be capable of doing in the next phase of training. Gradual progress is the key to all of this. And if ever a question, at all – I’m just a text/phone call away. Hi Vance! this is actually a step included for private coaching clients, BUT, if you want to do it in a more casual way - just post your daily checkin in the same facebook group page we've been communicating in.